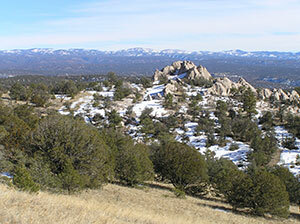 The United States Congress designated the Gila Wilderness (map) in 1964 and it now has a total of 559,311 acres. All of this wilderness is located in New Mexico and is managed by the Forest Service. On June 3, 1924, at Aldo Leopold's insistence, Gila became the world's first designated Wilderness area (and also New Mexico's largest Wilderness). Today this is one of the best destinations for backpackers in America. High mesas, rolling hills, and deep canyons distinguish the eastern portions, as do pinion and juniper woodland and a few grassland areas. Ponderosa pines blanket the central portion, with sheer cliffs outlining the Gila River. The west and southwest portions boast high mountains, particularly the Mogollon Range, with elevations up to 10,895 feet and steep canyons carved from the drainages of Turkey Creek and Mogollon Creek. The three forks and the Gila River run year-round, with creeks, springs, and tanks serving as alternative water sources. Searching for hot springs is worthwhile, but don't dunk your head in the water if you find one--some of the springs contain a microorganism that can enter the brain and cause death. An extensive trail system provides access to the Wilderness. Winter temperatures are mild during the day at lower elevations, but they fall to well below freezing at night. The higher elevations are usually snowpacked Dec. - Feb. July and August suffer the hottest temperatures, along with frequent heavy rains that can produce flash floods. Planning to Visit the Gila Wilderness? How to follow the seven standard Leave No Trace principles differs in different parts of the country (desert vs. Rocky Mountains). Click on any of the principles listed below to learn more about how they apply in the Gila Wilderness.